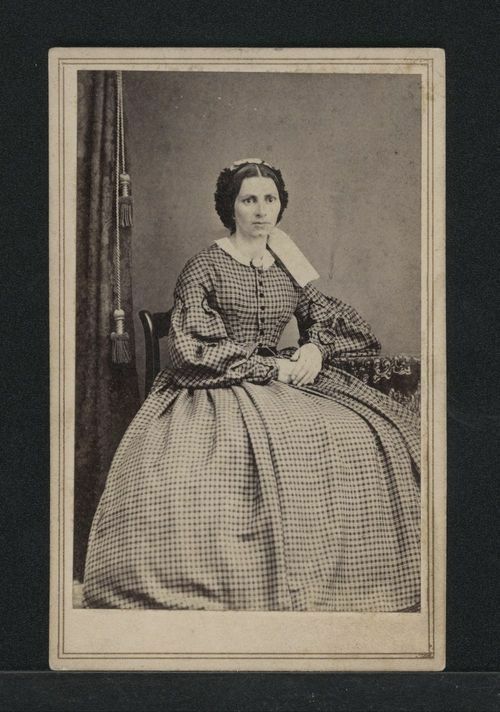 This carte-de-visite shows Rhoda A. Brown, (d. July 30, 1871 at the age of 37), the wife of Sheriff John Henry D. Brown of Douglas County, Kansas. During Quantrill's raid on the city of Lawrence, Kansas, Rhoda and her sister Maggie Stevens protected the sheriff from Border Ruffians by hiding him under their home. After the attack, nearly 150 men were dead and the town was left in ruins. Henry's second wife was Charlotte Maxon Brown (1840-1924). Mrs. Brown's portraits can be used in conjunction with the Quantrill material to discuss the violence of the raid, as well as the actions that the men and women of Lawrence took to survive the attack.